Click images to bring up larger versions in a popup. The majestic view from the chestnut and terracotta roofed terrazza of our house will linger in your memory long after you have left. The aspect of the whole house is to the south and west, with our breath-taking view from both bedrooms as well as the living and dining rooms, with their french windows onto the terrazza. In the traditional style of the region, where the villages cling to the steep slopes, layout and architecture are complex. The first floor at the front of a house can turn out to be the ground floor at the back. Upstairs in No.13, for example, an outside door leads to a courtyard which we share with our Italian neighbours who walk down to it from their front door! 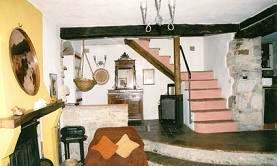 In the past, and sometimes even today, rural familes in the area shared their accommodation with their animals; it will intrigue you to try to identify the difference between barns, sties and bedrooms in the village! 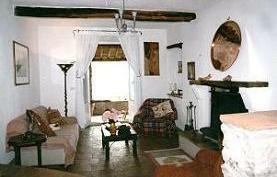 Happily we now restrict the accommodation of No.13 to humans - although the village cats will visit if you let them. When you arrive in Castello you will park at the foot of the village steps (or 'main street'), up which it is a short climb to the front door. While not a physically demanding ascent, this does unfortunately make the house unsuitable for less mobile people. Entering the cool outer hall you pass through the lobby to the spacious 30 square metre living room with its wood burning stove for autumn and early spring visitors. 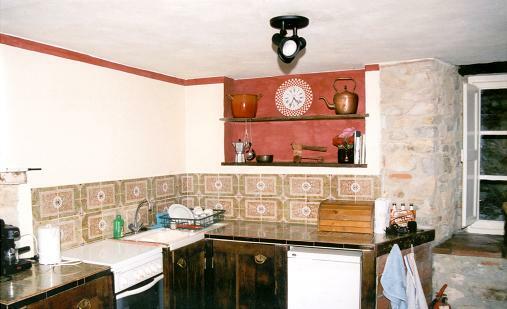 The terracotta floor is original, the walls a simple whitewash and the furniture and paintings a carefully chosen blend of traditional Tuscan and modern. History relates that parts of No.13 were the first building in Castello, and an ancient stone arch preserved from those earliest days leads through to the kitchen, which is fully equipped with all you could need, from a special saucepan for cooking your pasta to an electric espresso coffee machine and a range of glasses for your aperitif, wine and, of course, your post-prandial grappa! Two steps take you down from the kitchen to the dining room, which also boasts french windows opening on to 'that terrazza' for summer meals made in heaven. The stone staircase leads up to the bedrooms and bathroom. 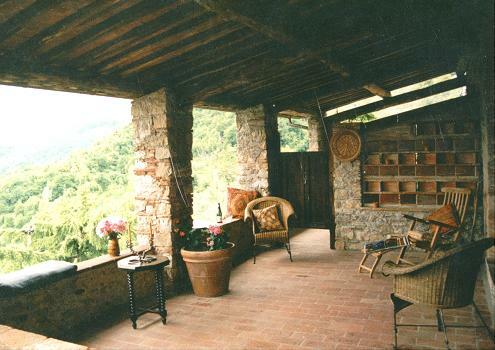 Both bedrooms have spectacular beamed chestnut ceilings and terracotta tiled floors, and both have windows opening over the terrazza roof to the valley and hills beyond. The master bedroom is a spacious 21 square metres. It has a king size double bed and traditional coloured glass door. The second bedroom is 16 square metres, an intriguing 'wedge' shape, and has twin beds. 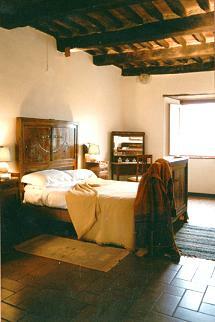 Both bedrooms have wardrobes, dressing tables and chests of drawers. The bathroom is fully equipped with bath, shower, lavatory, bidet and handbasin, and has an attractive coloured glass window. By the way, our washing machine is at your disposal. 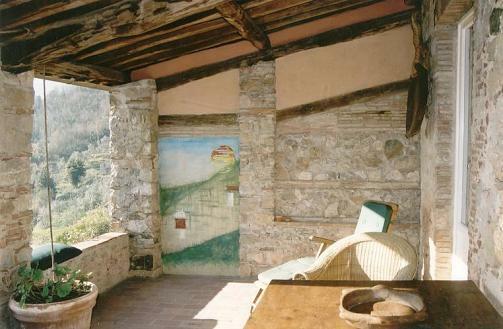 Especially in the summer months, the massive stone walls and shady terrace roof make the house delightfully cool and airy, helping you adjust to the easy pace of life in Castello. Sounds are gentle and there is not a swimming pool in sight! 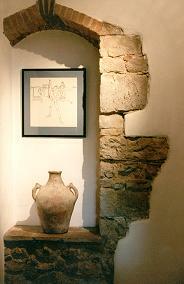 We are glad to share this special house with careful visitors when we cannot be there to enjoy it ourselves. Click here for a summary of the accommodation and facilities.